New York Fashion Week was this past week which has me thinking about fashion in the context of museums. It seems that fashion design is increasingly becoming a focal point for museum exhibitions. I would argue that this display makes high end fashion a bit more accessible for the average person– although they can’t take the items home with them, they can see them up close and learn more about the style and its history. The debate of whether fashion is art is something that continues- one could say there is always the possibility for fashion to be art. Below are some of my favorite fashion pieces I have seen over the past several months. Dress in top photo: Lanvin-Costillo Evening Dress (tulle)(1956). Mary Katrantzou is a Greek designer who works in London. Her work was on display in “Beauty-Cooper Hewitt Design Triennial” at Cooper Hewitt in New York. I love the spiky skirt on the Dam C coat and the magenta colors of the top paired with the neon pink belt. I really loved all the colors and textures on display in this exhibition but I especially love these two because although they are by the same designer they both seem to capture different moods through the use of material and color. The Met’s “Unpacking Fashion Masterworks” showcased a variety of designs- everything from traditional 18th century pieces to modern works from the 21st century. This dress made of butterflies is just eye-popping and I loved the way they paired it next to the other McQueen pieces that also had a similar nature theme. Costumes designed by Isaac Mizrahi (2014) for a production of The Magic Flute. 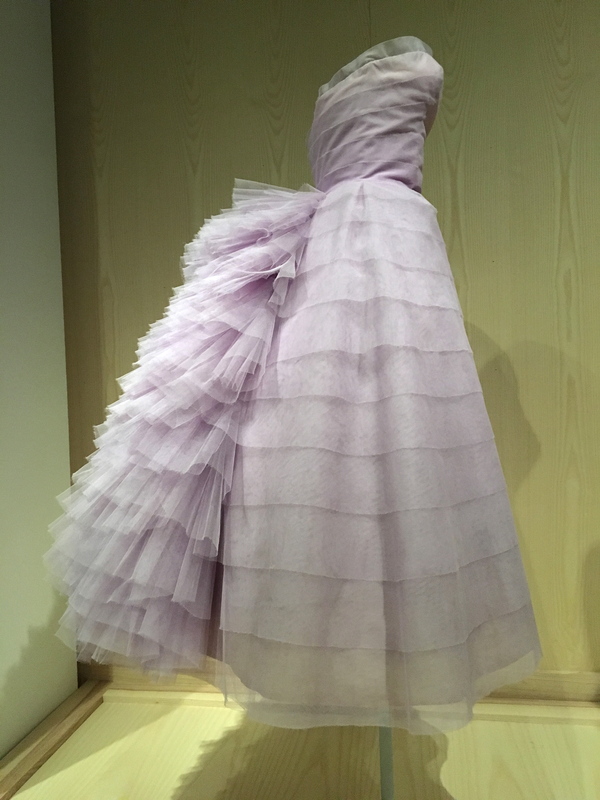 This pieces is by Victor and Rolf and was the first piece on view as visitors entered “Unpacking Fashion Masterworks” at The Met. It is made from polyester and silk/synthetic. According to Christie Chu of Artnet, Victor and Rolf are “self-proclaimed ‘fashion artists'”. I love the grayish blue color and pleating like quality we see all the way around the skirt. This seemed to be one of the most instagrammed pieces by far. It has a very delicate yet striking quality that seemed to resonate very well with visitors. Christina Kim is the founder of Dosa, a clothing and housewares line based in Los Angeles. She incorporates inspiration from cultures throughout the world and is known for her sustainable techniques. This show, “Scraps: Fashoion, Textiles, and Creative Reuse” showcases designers who have incorporated more environmentally friendly techniques into the production process. I love all the details in Kim’s work. Pieces shown in photo: Choga and slip, 2003-present; 1st Generation garment: Rabary Jacket, 2003-present; 2nd Generation Garment: Eunjie Skirt, 2007-present; 2nd Generation garment: Fraulein Dress and Slip, 2007-present. All photos by Hanna Cunningham, except as otherwise noted.